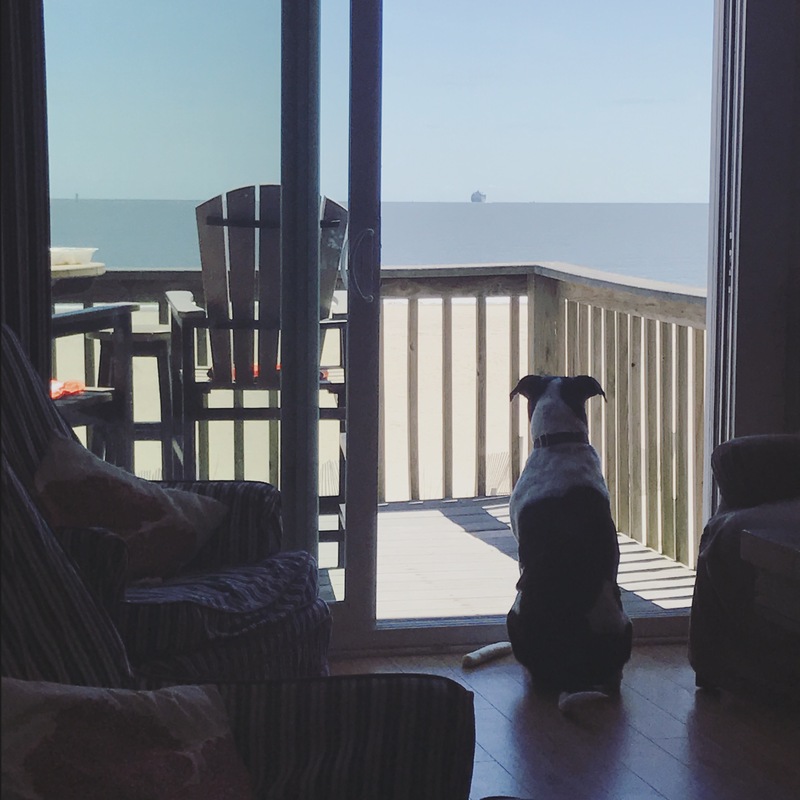 For our family’s spring break this year, we stuffed the minivan and headed to Tybee Island, GA. We got a 3-bedroom condo through AirBnB right on the beach. We were staying on the north end of the beach, where there was much less action (except for our last night when a police chase/car crash happened outside our window). Our place was even pet friendly, so this was our first trip with our dog in tow! The first morning, I drove a minute down the road to the IGA market right on our street and got what I needed for lunches and dinners. With dinners, I much prefer eating in, keeping the kids on somewhat of a schedule so they don’t turn into monsters, and not having to worry about occupying them through a long restaurant meal. No sense in paying for a meal that halfway through you’ll be thinking, “Please God, get me out of here now!” So anyway, the grocery store was small, but pretty well stocked, though very basic and the produce selection was not great. There happened to be a local farmer’s market at the lighthouse, so I held off on buying fresh produce at the store, to see what fresh and local produce I could get at the market. That was a mistake. The farmer’s market was mostly local artisans selling their wares, snack booths, and not too much in the way of produce! Do not be fooled. It’s a cute little local activity if you have nothing else to do. As an aside, I meet people everywhere I go when my dog is in tow, which is nice, and could be helpful in terms of getting the inside scoop on what’s going on. It also helps that you could tell he has some pitty in him. Pit bull parents are a bit of their own breed because they are so aware of how beleaguered their sweet pups are and what a bum rap they can get which is totally unjustified. Anyway…we spent most of our days heading out to the beach first thing in the morning, coming back for lunch, and trying to enforce a rest or naptime (ha! yeah right). Then the kids would go back out to the beach with my husband while I stayed back to cook dinner. It was actually the perfect way to get some quiet time. I could watch them out on the beach playing and flying a kite from our deck. My dog, Cosmo, would just sit there and watch them. It was idyllic. Dogs are not allowed on the beach at Tybee and I had heard they enforce it pretty strictly with heavy fines (signs said $290). There are 2 dog parks though (one for larger dogs and another for smaller dogs), a quick drive away. 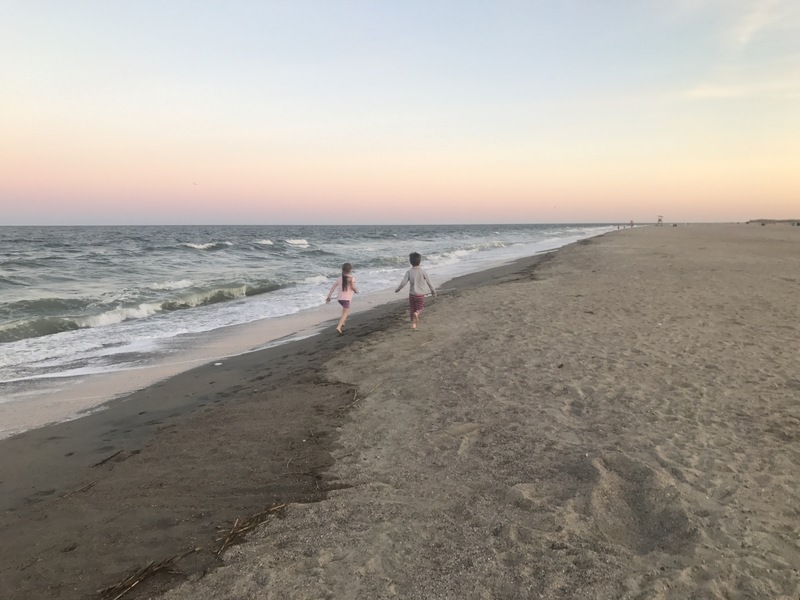 At the dog park, I gathered intel from a local dog owner about Fort Pulaski (about 10 minutes away from where we stayed) where you could take your dogs on the “beach.” She also admitted to taking her dogs on Tybee’s beach late at night. Thanks to having brought Cosmo, I ended up exploring so much more of the area than I otherwise would have. Every night, he got a long walk through the neighborhoods. Across the street from us was a quaint laid back beach town type neighborhood. Right down our street was the YMCA, City Hall, a well lit park where locals played basketball (but there were also tennis courts, beach volleyball courts and a playground) and the library. It felt like a real beach town. And it was absolutely beautiful with palm trees and Spanish moss peppered throughout. It was so quaint, I can imagine what it was like in the 50’s. Or maybe I’ve just watched Back to the Future too many times. Towards the north end of the island, were fancier Southern style homes mixed with old barracks from Fort Screven. My husband and I had some really magical walks in the park with a gazebo lined with trees. We also ventured onto the beach and enjoyed the full moon reflecting on the water. Tybee has these really cute swing benches on the beach-perfect for a romantic evening walk. Another dog note/word to the wise: if you’re dog is a little neurotic and afraid of unfamiliar inanimate objects, you might not want to tie his leash up to a random baby princess folding chair so you can swing on said swings…because he might just try to explore anyway and get super spooked by the chair following him, resulting in the funniest yet fastest 2 seconds of your life. Moving on…We drove down to the south end one night to check out the nightlife and saw some spring breakers, but it wasn’t in full swing yet and was pretty tame. It’s a small area with a few bars; I spotted some karaoke going on. Best of all, I discovered Wet Willies, which I thought was just a slushie place since I saw a wall of spinning slushies like you would see at 7-11, but with numerous options. As we entered, I realized, they were alcoholic and you could take them TO-GO! I don’t drink a lot these days, but I was like a kid in a candy shop. Apparently, this is a chain because I saw another one when we visited Savannah (it’s on River Street). On Tybee, the beach itself was almost empty where we were. The waves were perfect, big enough to be a little intimidating but not strong enough to pull you under. I remembered the fun I used to have as a kid diving under the big waves, calculating if I could ride the next one coming or duck under it to avoid getting smacked. 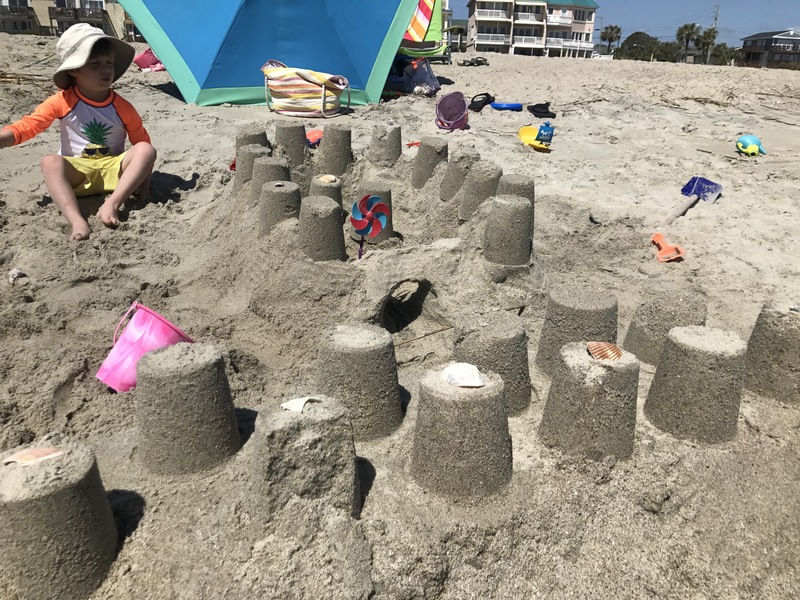 We built sandcastles, forts, and moats. 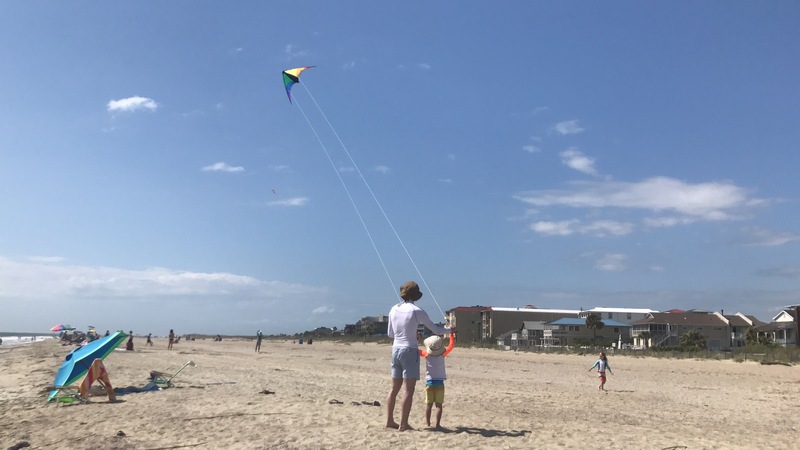 The kids learned how to fly a kite. I could have stayed another week, simply laying around on the beach, reading, resting, building, and swimming. 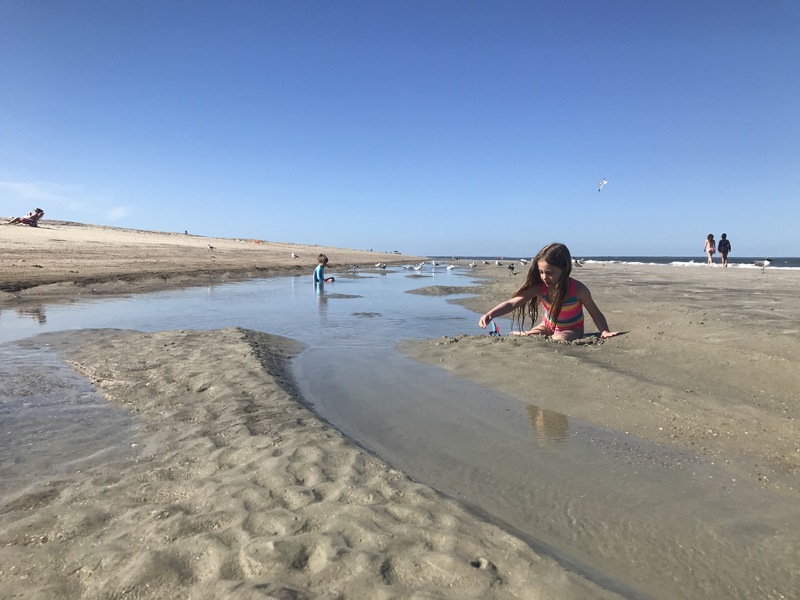 Low tide provided the kids with their favorite part of the beach-warm shallow pools of water in which to play! Every morning, I was up just in time to catch the sunrise and attempt a time-lapse video with my tri-pod. I’ve started getting into the habit of collecting art from our travels. It makes a great souvenir, fills our walls with meaningful memories and supports local artists. What’s not to love? We found an outdoor barbecue restaurant, which had a really cool motif. Southern BBQ isn’t my thing though. Not a fan of so much fried food. Corn on the cob felt like the freshest veg option. What does this have to do with art? Well, this restaurant doesn’t serve dessert, but we spotted a gelato sign down the road. So we walked over to the gelato place and found this oasis of a gift shop/gelato/art gallery cuteness complete with a swinging bench. What it is with swinging benches down here, I don’t know, but it works. The Tybee Cottage Art Gallery displays art from a group of local artists. The one I finally chose was by Bonnie Bishop.